The wait is over and the results are in! The winner of the 2017 Mason-Lite photo contest is Western Fireplace Supply in Avon, CO. Western Fireplace Supply installed the beautiful custom Mason-lite see through fireplace shown below. These photos show how versatile custom Mason-Lite fireplaces are. The fixed glass on the back side of the see through fireplace allows the fireplace to function as a single sided fireplace in regards to the draw/ draft of the fireplace. In adding this fixed glass the venting required for the unit is drastically reduced. We would like to thank Western Fireplace Supply again for their great installation of this unit and for providing this great photo. We would also like to thank all other submissions for this years contest. We will be posting all of this years entries in our gallery page at Mason-lite.com/gallery shortly. We strive to show our product in finished form for our customers and we could not do that without the help of our trusted dealers and distributors. Mason-Lite Fireplaces is proud to announce that our fireplaces will be featured in an upcoming episode of “America’s Most Desperate Landscape” filmed in Mobile Alabama! What better way to transform your desperate landscape than to put in a brand-new Mason-Lite Vent Free Fireplace. The contractors had a very specific design to follow and our standard firebox did not quite fit; good thing Mason-Lite Fireplaces have a wide range of customizable options! They settled on a reduced depth, vent-free see-thru firebox that would make the dream backyard a reality. The unit went up without a hitch and looks great! We were even able to have David, one of the homeowners, get his hands dirty and see just how simple our units are to install. The unit finished off wonderfully with our running bond brick panels and a beautiful Linear Burner from FireGear. Below you can see an unfinished photo of the unit. Check back in for the finished photos!!! The episode will be Airing May 29th at 8 PM EST on the DIY Network. Check out this great article posted in the Hearth and Home Magazine. When considering a gas-log fireplace for your home or business, look to Masonry Fireplace Industries (Mason-Lite). Mason-Lite, a leader in pre-fabricated modular fireplace kits, offers an array of gas log fireplaces to meet your personal needs, starting with the B-Vent gas-burning series modular masonry firebox kit. The concept of the B-vent fireplace, also known as atmospherically-vented, or natural-draft, grew out of the Environmental Protection Agency’s Clean Air Act laws regulating wood stoves, which first went into effect in 1988. Natural gas and propane fireplaces provide the benefits of a wood-burning fireplace, but with far lower emissions. As concerns for air quality increased, and rules, regulations and restrictions regarding wood-burning fireplaces became more prevalent, popularity in natural gas and propane fireplaces has grown. Mason-Lite modular masonry gas fireplaces are designed for those who desire the convenience of a real fireplace for those special occasions, like dinner parties, and intimate gatherings with friends and family, but without the mess and hassle that comes with a wood-burning fireplace, and without having to collect and store stacks of firewood. And with a Mason-Lite gas log fireplace, there’s no such thing as a “no-burn” restriction. The Mason-Lite B-vent series of gas log systems offers an array of benefits and safety features. The B-vent system relies on a natural draft system and specially designed pipe to automatically carry combusted gases out of the home. Ventilation occurs naturally and doesn’t require electricity, thus improving safety. Each unit is to be paired with a listed B-Vent chimney system, designed to protect both chimney and structure from fire and to be low-maintenance. We recommend chimney systems that meet UL 441 as well as UL 1777 requirements for residential factory-built, gas-burning chimneys. Each Mason-Lite unit (MGFP39-MGFP49) comes with a standard 10-inch flue hole attaches to an anchor plate for your B-vent chimney system. Our MGFP43ST model comes with a standard 12 inch flue. B-vent chimney’s size makes it perfect for projects with reduced framing requirements. Why go with a Mason-Lite B-vent system? For one, Mason-Lite’s combined 100-plus years of experience means we keep up to date on all local, state and federal requirements for safety and air quality protection. Our units meet EPA and current building codes for both indoor and outdoor construction. All Mason-Lite B-Vent fireplace systems are independently tested to pass the ANSI (American National Standards Institute) Z 21.50 gas fireplace safety standards when installed to manufacturer instructions for safe operation. Mason-Lite B-Vent natural gas masonry fireplace systems provide the warm glow of a real wood fire. The fireplaces burn more cleanly, with lower outputs of carbon monoxide and other pollutants and particulate matter, than their wood-burning counterparts. Mason-Lite also recognizes the added value of installing a gas fireplace in a new or existing home, and can customize your fireplace to give it an authentic look and feel of real wood. Our systems can be retro-fitted to fit your existing fireplace. All Mason-Lite fireplaces kits are made in the U.S.A. Modular, pre-cast systems are light weight, which means lower shipping and handling costs and more affordable pricing. Because they are made of light-weight materials, Mason-Lite fireplaces are easy to install, and can be installed on multiple levels of the home or office with minimal reinforcement. Mason-Lite offers three sizes – the 39-inch and 44-inch models offering 65,000 BTUs; and the 49-inch with an output of 80,000 BTUs. Mason-Lite B-vented series includes an RH Peterson “RealFyre” gas log set, designed to replicate the natural beauty of wood, with remote control. Mason-Lite can also provide custom B-Vent Modular masonry fireplace for your special fireplace needs. Please visit Mason-Lite.com/Customorder for more information and a quote. Mason-Lite recommends you always maintain a reliable carbon monoxide detector in the home or office, regardless of what type of fireplace you use. For more questions regarding which fireplace is right for you, call 800-345-7078, visit our website at www.mason-lite.com, or find us on Facebook. Whatever questions you have, Mason-Lite has the answer. Below is our PUREBURN brochure link as well as a photo of the unit from the HPBA 2015 show. When installing a new fireplace or replacing an existing one, the last thing homeowners want is to wade through the myriad bureaucratic levels of local, state, regional and federal clean air standards for home fireplace safety and emissions. Masonry Fireplace Industries, makers of Mason-Lite pre-cast modular masonry fireplace systems since 2005, utilizes more than 100 years of combined experience to take the worry out of fireplace installation and replacement. They understand the Environmental Protection Agency’s regulations, thus ensuring that your fireplace meets or exceeds EPA Phase 2 guidelines. After all, when you’re curled up in front of the fireplace enjoying the warmth and the crackling sounds of burning wood, the last thing on your mind is air quality. Masonry Fireplace Industries strives to keep pace with changes in the industry and in emission standards and guidelines and have introduced the Pureburn line of home wood-burning units. All models meet or exceed EPA Phase 2 standards for residential fireplaces, giving you years of worry-free use. Our products are independently tested by the PFS Corporation testing agency to meet or exceed the EPA’s guidelines and National Fire Protection Association standards. Mason-Lite clean burning masonry fireplaces also meet UL 127 listed standards when installed according to manufacturer instructions. Numerous studies have identified wood smoke as containing fine particles that can pose potentially serious public health risks. The Clean Air Act of 1970 has cut air pollution even as populations have risen. Yet today, according to the EPA, wood smoke from an estimated 12 million fireplaces and wood stoves continues to create significant health risks. In 2007 the EPA created the Burn Wise partnership program to ensure that cleaner outdoor wood-burning units are available to consumers. In October, 2008, the EPA moved to Phase 2 of the Burn Wise program and required that all residential wood-burning units installed after 1988 meet air quality guidelines. Mason-Lite Pureburn fireplaces are designed to pass or surpass current air quality standards without the use of a catalytic converter, which can require mandatory annual maintenance and costly replacement during the life of the fireplace. Mason-Lite’s gas-assisted component eliminates the need for costly catalytic converters, thus reducing unit costs and installation time. In addition, Pureburn units have tested to 2.6 g/kg of emissions, placing them below voluntary EPA Phase 2 emission levels of 5.1 g/kg and making them more efficient that GreenTech Solutions Isokern units, once considered the industry gold standard. Homebuyers will pay extra for a fireplace, considered by the Hearth, Patio & Barbecue Association to be among the top three desired features requested by new home buyers (1). Mason-Lite Pureburn units can result in savings of up to 50 percent over hand-built masonry fireplaces. 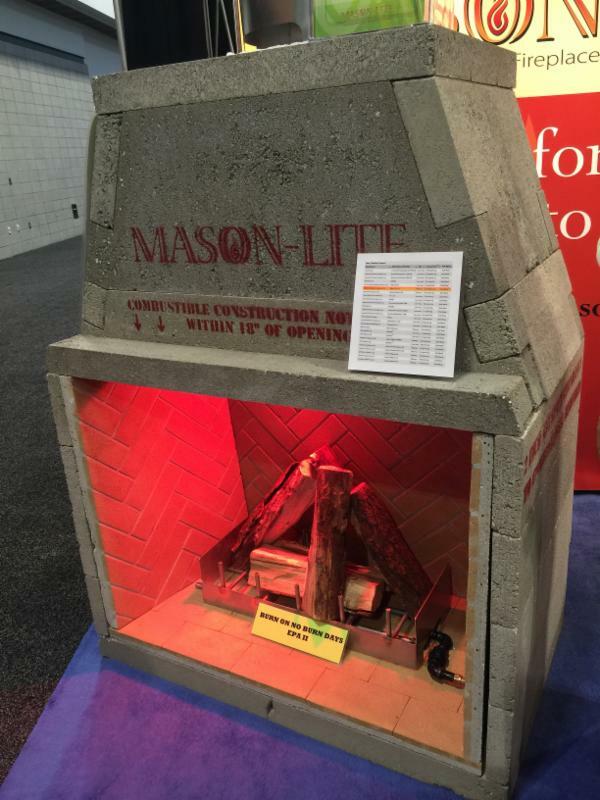 Mason-Lite concrete fire boxes are the lightest in in their class in terms of weight and highest in terms of heat-resistant strength. Because of our lightweight design, Mason-Lite Pureburn units can be installed throughout multi-level homes. Mason-Lite fireplace systems can be installed indoors our outdoors and accommodate wood, natural gas and propane gas systems. We design our units with safety in mind and all of our systems comply with UL 127 and UL 103 chimney component standards for factory-built fireplaces installation. They also come with a 10-year limited warranty. Our easy, “no-mess installation” means faster completion time and results in lower installation costs. Over the years we have had many inquiries pertaining to offering certain complementary products. We are excited to present some new additions to our Mason-Lite Price-list that we feel will really benefit the sales of our products. First, We are proud to announce that our “Pure-Burn” EPA Phase II Fireplace is coming on to the market. Currently we are offering the burner and grate system to be retrofitted into our MFP44. For more information on this unit please contact us. Second, We have added additional products to our Accessories and Dampers. We have added the see-thru air kit (MFPST-AK) for both see-through units as well as custom units with square sides. We have added our new arch for use with the MFP63 (MFP-ARC63). We are also expanding our cast iron dampers to include all of our standard sizes (33″-63″). Note: The MFP-CC56 is a custom made damper. Third, We have added our both our Masonry Chimney Cap (MMC-14) as well as our Fire Ring Cap (MFR-CAP) to the second page. Our masonry chimney cap acts as a spark arrestor as well as a rain/debris shield for our masonry chimney systems. The fire ring cap was added because our Unfinished Fire Ring does not include a cap because the customer has the option of using their own finishing material. Lastly, We have added the Roof Radiation Shield (##DCA-RRS) as well as the Attic Insulation Shield (##DCA-IS) under the DuraChimney packages. We have found these to be very beneficial to the chimney systems. These changes will take effect in September. Please contact us with any questions you may have about these changes. We are excited to announce that we have successfully moved the location of our production facility. A few of you may have experienced our extended lead times during our moving process. We apologize for an inconvenience this may have caused but it was truly unavoidable. Now that we are fully moved, you will see our lead times lowering back to before the move. With our new factory layout, we have the potential to have even lower lead times than ever before! We have also invested in new tooling and equipment to improve our quality. We have decided to change the brick we use for our firebrick panels. We have had a little trouble with blemishes in our old firebrick. The new brick will not only have practically no blemishes but it is also a stronger brick. This will ensure an even higher quality of product than we are already supplying you. We chose the closest color to our old brick which is a gold. We have had a great response to the color so far. I have attached a photo of our old brick and our new brick for a visual. The best part is the price of the panels will not be effected by this change! We will start shipping this new brick this week. Please note that we will not mix any old brick and new brick in your current or future orders. A fireplace can be an appealing addition to any room, home, or business. However, some people find that a traditional, flat-front style fireplace does not meet their needs. As a result, more people are installing corner space-saving wood burning fireplaces in their dwellings or businesses. Mason-Lite specializes in all sizes and styles of fireplaces, including smaller units that tuck neatly in a corner. Our team of fireplace experts can listen to your space needs and help you pick the right wood burning fireplace for your business or home. We are always happy to learn from our readers. What factors motivated you to choose a corner fireplace? What are the advantages of a corner wood burning design? Do you live in a condominium, narrow town house, or older home? In these dwellings, and many others, floor space is limited. If your rooms have a small footprint, you may think installing a wood burning fireplace is not a good option for you. However, a corner wood burning unit can fit comfortably in any vacant corner. Even if you have large rooms, you can consider subdividing them into cozy seating or reading areas, accented with a corner fireplace. You can have all the furniture and floor space you need, while having the relaxing comfort of a crackling fire to warm your loved ones on cold days. A traditional flat-front fireplace takes up a lot of floor and wall space. This style, while very classic, can limit your ability to add furniture or decorations to accent your room. A corner wood burning fireplace is the best option when space is a premium. It takes up very little wall space and does not project as far out into your room. Before you build a corner-style fireplace, or any fireplace, you need to consider your room layout carefully. You need to contemplate more than just the size of the fireplace unit itself. Think about normal traffic flow through the room. Be sure your fireplace location is at least 36 inches from any combustible wall that lacks protection. If you add a wall protector, you may be able to reduce the clearance to 12 inches. Also, you should plan for a non-combustible hearth extension on the front and side of the unit. In addition, you might want to consider devoting space to wood and fire-tending tool storage for added convenience. Corner fireplaces are rapidly growing in popularity. Those with interior decorating flair recognize the value of space-saving wood burning corner fireplaces. A corner set up leaves more wall space open for furniture. They can also provide essential warmth to a room. Because of their compressed size, corner fireplaces can fit in more rooms—such as bathrooms and kitchens. In many cases, homeowners want their wood burning corner fireplace to be the focal point of their room. In this scenario, adding a mantle or attractive surround can draw attention to a wood burning fireplace in any corner. Savvy home decorators suggest that homeowners can use lighting, artwork, or even an flat screen TV near a small corner fireplace to ensure it rises to focal point status. Decorating experts recommend that homeowners consider furniture placement layout before installing wood burning fireplace in a corner. Creating a comfortable living space should be the paramount goal. You can achieve this by ensuring the furniture pieces you plan to use most to face the fireplace. Also, consider using area rugs and furniture groupings to match the angle of your wood burning corner fireplace. If you are working with a very small seating space, using lightweight or swivel chairs can create a corner conversation area near your wood burning fireplace that you can reconfigure with ease. You can also use a corner fireplace to fill out empty spaces in a large room. In addition, if you have a awkward or unbalanced room architecture, a wood burning corner fireplace can help provide a grounded, balanced look. Wood burning fireplaces tucked in a corner are not only appealing for a home—they can be great for your business too. Whether a business owner has a professional office or a retail location, having a corner wood burning fireplace can provide a welcoming environment for clients. For example, since a fireplace conjures a home-like feeling, having a corner wood burning fireplace in a medical office can put patients at ease before appointments. These days, fireplaces are often found in restaurants, since they help patrons relax and enjoy their meal. Wood burning corner fireplaces can also create a soothing mood in salons and other spaces. If you operate any type of business, think of the many benefits a corner wood burning fireplace can bring. If you have an empty corner in your home or business, a wood burning fireplace might be a good decorating choice. Also, if you have an older model wood burning appliance, such as stove or fireplace, upgrading to a new model is advisable. As the United States Environmental Protection Agency notes, modern wood burning fireplaces are 50% more energy efficient and produce 70% less pollution than older models. Having a wood burning fireplace in your corner not only boosts your room aesthetics, it also makes good economic sense. When shopping for a corner wood burning fireplace, you should seek top-quality advice. At Mason-Lite we have more than 100 years combined experience in the fireplace industry and can provide you with all the information you need. We are recognized as one of the top providers of modular fireplaces—including corner models. What helped you choose a corner-style fireplace over a traditional model? What decorating tips do you have for people who want a corner fireplace?